The market is asking for consistency, but improving the assortment from time to time is essential as well. That is why Colombian rose grower Jaroma Roses every year renews 10 percent of their farm – which is 32 hectares in total. Last year they also expanded three hectares. 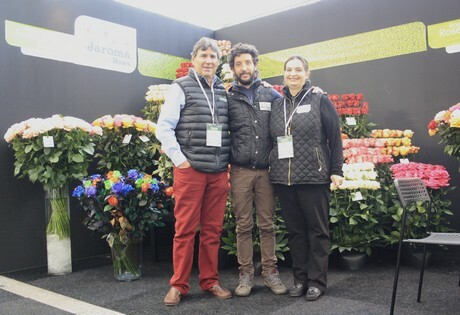 At the IFTF Jaroma Roses presented 10 new varieties: Lola, Pink Mondial, Salma, Frutteto, Magic times, Sky Garden, Moonstone, Mandarina, Shimmer and Wasabi. "More new and exciting ones are coming in 2019 for Mothers' Day like playa Blanca, Light House & Impact", says Jaime Rodríguez, the president of Jaroma Roses. The Jaroma team at the IFTF: Jaime Rodríguez, Diego Rodríguez and Adriana Correa. Jaroma Roses is located in the north of Bogotá. They have offices in Bogotá and Montreal. In the farm 650 employees work every day to supply all these different markets with roses.